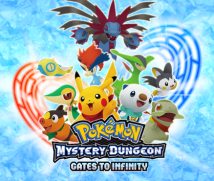 Up to now, there have been two versions of most Pokémon Mystery Dungeon games. This time around, however, there’s only one version. Is there a reason behind that? Simply put, we felt that one package was enough. The game already contains a number of different elements, including an enjoyable story, an adventure which involves scanning round objects, co-operative play, StreetPass15 features and more. We therefore thought it was simpler to just have one version – an ultimate version, if you will.15. StreetPass: A communicative feature of Nintendo 3DS that allows players to exchange data with each other simply by leaving their console switched on as they walk around. 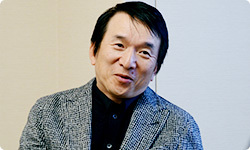 I actually get the impression that you feel you’ve created the ultimate Pokémon Mystery Dungeon game, Ishihara-san. Yes. I think this is our richest and densest title yet. Even if you get stuck on the story at some point, there are so many different ways of playing the game, it’s possible to try a different approach and still make progress. For example, a player could find a round object, scan it and enter a new dungeon where they can find items that they can send to their character in the main game, allowing things to develop in a completely different way. I see. Since one of the features of this game is that making progress through dungeons can sometimes become rather difficult, you’ve created a number of alternative routes for players to take. This allows players to take a breather, and potentially provides them with a trigger that allows them to clear a particularly tricky dungeon. Nagahata-san, where do you think Ishihara-san’s sense that you have created an ultimate version comes from? I think the richness of the story is one factor. I also think that there are just so many features, using a variety of devices; it’s kind of like a toy chest. I think this helps add a lot of depth as well. But it’s not just the fact that a lot has been crammed in, is it? I really get the feeling that everything’s connected together really neatly. Yes, that’s a key point. This is a game that each different player will progress through in very different ways, but I think we’ve been able to ensure that the game is flexible enough to adapt to all these different approaches. I get the impression that this broad-mindedness is connected to the feeling that we’ve created an ultimate version. What do you think, Tomie-san? Hmm, let me think… I’ve always done my best, both when writing for this title and for previous series, so it’s hard for me to say “This is the best”. One thing I was really conscious of with this title was our aim of trying to make players think, “From tomorrow onwards, I’m going to do my best in school or work!”. You mean, you wanted to write a story that made people feel good? Yes. I really want the players to not give in until the end of the story. Now, this is also the first time in the series that you’ve decided to offer additional content for a title, isn’t it? What do you think about the possibilities that additional content open up, Ishihara-san? Additional content increases the possibility to provide for people who want to keep playing the game after finishing it, or who want a tougher challenge. Things like that can’t really be provided with a standalone packaged product. That’s right. What’s more, it also gives us the opportunity to provide players with things that will help them progress through the main story. 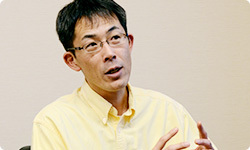 Nagahata-san, from a player’s point of view, what do you think about the idea of making more dungeons available to players? Personally, I’m all for it. If there’s only one route through a game, players might get stuck and find themselves unable to proceed. If we’re able to increase the number of choices a player has, however, I think we can negate that kind of situation. The game also includes a ‘StreetPass Help’ element, which can make it easier to progress through the game. Not only can players save the Pokémon world as part of a rescue team,, but they can also help each other within a dungeon. This is a system that allows players to use StreetPass to help other players, isn’t it? That’s right. In the past, the process of helping a player would have involved going to the location where they were defeated. This time around, however, things are much easier. Just walk around with your Nintendo 3DS system in your pocket and you may find yourself being helped out by another player at any moment! That certainly does sound much easier! (laughs) As someone who’s responsible for a series known for making players battle against themselves though, Nagahata-san, were you at all conflicted about the extent to which you should be extending such kindnesses? That was a very difficult issue. When you compare it with older titles in the series, there’s no doubt that this Mystery Dungeon game is on the easy side. To be honest, however, I think that Chunsoft games are defined by systems that are thoroughly kind and fair. This is something I’ve felt ever since you made Dragon Quest16. It’s only the systems and the UI17 that are user-friendly, though. The games themselves pretty much abandon players to their fate! (laughs)16. Dragon Quest: Chunsoft were responsible for programming on the early Dragon Quest titles, from the first game in the series (released in May 1986 in Japan) to the fifth game in the series, Dragon Quest V: Hand of the Heavenly Bride. The titles were originally published by Enix (now Square Enix).17. UI: Short for ‘user interface’. The term refers to the appearance and operation of what appears onscreen when using a computer system (windows, menus, icons and so on). Yes, that’s right… (laughs) Some people feel that the difficulty is an inherent part of a game’s appeal, while there are others who will say “This is too difficult, I can’t handle it!” It’s tough to get the balance right. I feel that players’ tolerance towards games is changing over the generations as well. I don’t think modern players would believe how difficult games from the Famicom generation used to be. It does feel like the number of people who feel that difficulty itself is part of a game’s appeal is gradually decreasing. If anyone’s worried that Pokémon Mystery Dungeon is going to be a forgiving experience, though, I can say quite emphatically that this isn’t the case. The idea that this is a game that looks cute but is not to be taken lightly is still very much present in this title, I think! (laughs) In fact, the next thing I want to talk about is how you managed to achieve this balance.